Sunburn makes your skin look dark and reddish and in extreme cases you may feel a burning sensation on the skin as well. It takes many days for it to go away. You may think that other than making your skin look burnt, there is no other harm in it. But in fact, it has more to it. When your skin is exposed for a long time to the sun, the UV rays of the sun can affect your skin and make your skin age fast. It can also cause skin cancer. In spite of applying sunscreen on your skin, you may suffer from itchy and painful rashes. This is commonly known as sunburn. You need not worry any more about sunburns. 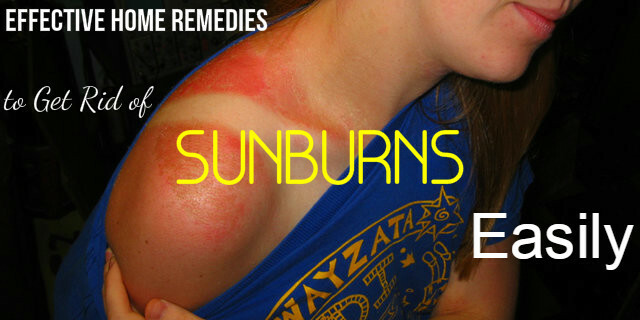 Here are some effective home remedies that help you get relief from sunburns in a natural way. Take a spray bottle and fill it with apple cider vinegar. Spray it on the affected area and let it dry. If your skin is sensitive, mix ACV and water in the ratio 3:1 and then apply on the skin. After it gets dry, you can pour a few drops on coconut oil on the affected areas and then rub gently with your fingertips. Wait for half an hour so that it gets absorbed in the skin. Pluck a few aloe vera leaf petals and take out the gel from the leaves. Put this gel in the refrigerator for 30 minutes and then apply it on the affected areas. Wait for an hour and then wash off with water. Apply it once a day till you get the desired results. Mix the baking soda in your cold water bath and soak in it for 20 minutes. After your bath. Pat dry your body after the bath. You can also mix three teaspoons of baking soda in one fourth cup of water and make a paste. Apply this on the affected parts of the skin. Wait for 10 minutes and wash it off with water. Apply this once in every morning till you get rid of sunburns. Sip the towel in ice cold water and place it on the affected areas of the skin. Keep it for 10 to 15 minutes. Try it two to three times a day. Take one cucumber and mash it. Apply it on the areas affected by the rays of the sun. Wait for 20 minutes and then wash it off with water. You should apply only chilled cucumber on your skin. You can also take the juice of cucumber and keep it in a spray bottle. Spray it on the sunburnt skin to get relief. Repeat it as many times as you can. Honey is beneficial for the skin in many ways. To treat sunburn you need manuka honey. Take some manuka and apply it on the skin affected by sunburn. Let it remain on your skin for 15 to 20 minutes. Try it at least once every day till you get positive results. Mix all the ingredients and then apply it on the affected parts of the skin using a cotton ball. Wait for 10 minutes and then wash off with cold water. Pour the milk in a blender and blend it well with oatmeal and honey to get a paste. Apply it on the affected areas of the skin. Wait for 20 minutes to get it dry and then wipe it off with a cloth dipped in cold water. Mash papaya and add honey to it. Mix well to get a smooth paste. Apply this on the affected areas and wait for 30 minutes. Peel one potato and rub it gently on the sin suffering from sunburns for about 10 minutes. You can also mash one potato and apply the mashed potato on your skin. Apply it at least once every day till you get relief from sunburns. After you make tea, do not throw away the tea bags. You can save them for treating sunburns. Take the pitcher and pour warm water in it. Soak tea bags in it till the water becomes black in color. Wait till the water is lukewarm or of normal temperature. Now dip a washcloth in it and dab it gently on the areas of the skin affected by sunburn. Wait till it gets dry. Applying it this way for at least once in a day will soon give you positive results. Yogurt is great for treating sunburns. You need unsweetened and unflavored yogurt for treating sunburns. Take cold, unflavored and unsweetened yogurt and apply it on the affected areas. Let it remain on your skin for 20 minutes or till it gets dry. Wash it off with cold water. Apply it at least once in a day till you get relief from sunburn.